GSM (Global System for Mobile Communication) is the most popular and widely used digital mobile phone technology adopted around the world. Today, there are more than 567 million GSM subscribers in the world under 400 networks in 171 countries. GSM accounts for 70.5% of the world’s digital market and 65.75 of the world’s wireless market. According to the GSM association’s analysis the world subscriber growth till July 2001 is 800 million. The adoption and popularity of this standard over for example CDMA is its wide availability and subscriber base through out the world. Some developing countries have had striking success in mobile and there is reason to believe this can be emulated elsewhere. For instance, in China, mobile devices accounted for one third of the growth in telecommunications over the last four years. Similarly, Bangladesh is expected to experience a significant development of mobile service in the near future. ** Includes operating license fee; shared revenue; fees and royalty for radio equipment, VAT, Customs, Excise,, customs duties at import point; advance import tax, taxes (stuff, expatriate, corporate, etc. ), BTTB interconnection charges and customs duties on handsets imported by retailers who serve GP customers. International statistics indicate a potential total domestic market of USD one billion for Bangladesh. Developed countries spend on an average of three percent of GDP on telecommunication services while developing countries spend only around 1.3 % due to insufficient infrastructure and profitability. Bangladesh should have annual telecommunication revenue of around 2.5 % of GDP with complete coverage and infrastructure. Bangladesh is still one of the least penetrated Tele market in the world though over the past few years this rate has increased gradually. Presently, the mobile phone penetration rate is 0.53% which has increased by 0.31% from the last year. The fixed line penetration rate is 0.42% and the total telecom penetration rate is 0.95%. The total mobile phone subscriber base of 695,000 has surpassed the total number of fixed lines by the end of 2001. But demand for telephony services far exceeds the supply of that. A forecasting model (prepared by HASS International Business Development) has been used to estimate the potential market size for mobile phone in Bangladesh. The main driver of the model is the cut off level of monthly household income of buying a mobile phone. The high-end market for mobile phone is estimated at Tk. 15,000, medium end market is set at Tk. 10,000 and for low end market cut off level is at Tk. 6000. According to the study the total addressable market is estimated at around 10 million. This huge unexplored market represents a potential opportunity for mobile operators in Bangladesh. The mobile market is mainly dominated by GrameenPhone, which continued to be in the number one (1) position for the last four years. Other mobile operators are Citycell, Aktel and Sheba Telecom. GrameenPhone Limited is holding 85% of the market share and its accumulated subscriber base reached at 10,50,000 by the middle of 2004. Pacific Bangladesh Telecom Limited (PBTL), Citycell holds 15% share of the mobile market with a subscriber base of 98,000 at the end of December 2001. The current penetration rate of Citycell is 0.08%. Aktel currently holds 11% market share with a subscriber base of 75,000. Its penetration rate is 0.06%. Sheba holds 4% market share with a subscriber base of 27,000 based in Dhaka at the end of December 2001. Its penetration rate is 0.02%. The Telecom market has grown more matured over the last year in terms of subscriber base, penetration rate and growth rate. Four mobile operators, are the major players in the Telecom market and the number of mobile phones of all mobile operators exceeded the number of fixed line telephones in 2003. 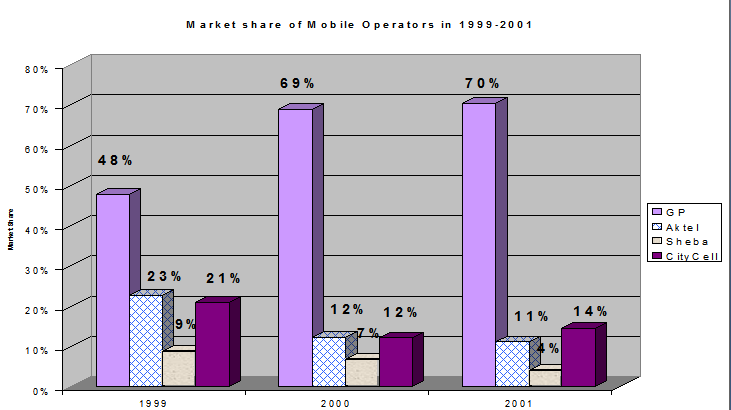 Growth rate of mobile operators continued to be high in 2003. Citycell and Aktel experienced higher growth rate than Year 2001. All mobile operators except Sheba had more than 100% growth. Matured telecom market ensures profit potential for gray markets thus the development of gray markets were higher. Increase in POS make telecom services more available and easy to subscribe. With the coverage expansion, low pricing strategy and increased number of POS there has been more scope to penetrate into different market segments of the country. As the awareness of about mobile technology has grown in the over all market, the expectation of users from service providers has also increased. This has resulted in the continuous effort to improve service and has increased competition. The demand for Mobile communications has increased tremendously compared to the availability or supply of the service, as a result unmet demand is noticed in the market. Increased demand for a complete mobile solution is prevalent in the market. Subscribers expect a complete phone with national mobility and connectivity with BTTB. Pre-Paid mobiles are gradually becoming more popular and being perceived as the efficient means of communication thus demand for Pre-paid has increased. 80% of the new sales of GP in 2001 was Pre-paid. Pre-paid market is growing more rapidly than Post-Paid market. rest 7% belongs to Sheba (Banglalink). In the Pre-Paid market 99% of the total Pre-Paid product belongs to GP and rest 1% goes to Aktel. Subscribers have become more aware of the usage and benefit of value added services (VAS) like SMS, VMS and especially WAP. Market trend reveals that there is a growing demand for VAS in the market. As GrameenPhone is expanding through the six divisions, the demand for coverage throughout Bangladesh is also increasing. In the mobile market GP faces direct competition from three (4) cellular phone operators; Citycell, Aktel, Sheba Telecom (Banglalink), and Teletalk.. The following discussion will illustrate each of these operators separately. Citycell got its license to operate in 1985 in the name of Hutchison. They started operation in 1987 but actively launched service in 1993 with AMPS. License has also been provided for Fixed Radio Network operation. The license was based on “Senders Keepers” basis, which is an advantage for them. However this is also a disadvantage since they don’t receive any revenue from BTTB incoming calls, which are still higher today since BTTB has more subscribers. In the future “senders Keepers” may become more advantageous if Citycell grows as expected. Citycell is owned by PBTL 35% (Present Foreign Minister is the owner), 35% by Japanese Far East Telecom, 20% by Asian Infrastructure Development Company and 10 % by Japanese Fujitsu Ltd. However talks are underway for restructuring the ownership. Discussions are on the way where NTT Docomo of Japan would set in the ownership. First to adopt CDMA technology in the sub-continent. First ever-private wireless network in Bangladesh. First to connect Cox’s Bazaar to rest of the world. Pacific Bangladesh Telecom Limited has upgraded its network from the AMPS to the state of art CDMA technology. Now it has SDH microwave network-connecting area between Dhaka – Chittagong and Dhaka – Sylhet. PBTL used the brand name “Citycell” digital to market its cellular products, when it launched its service in 1993. As Bangladesh’s first mobile operator, Citycell acquired a customer base that was both highly affluent and in need of constant communication services, providing the company with higher than average revenues. Citycell has largely retained this customer base by adopting CDMA, a non GSM-compliant technology and by requiring its first subscribers to pay a high one-time fee. While CDMA is a technologically superior standard, CDMA handsets cost more than GSM units, increasing the startup cost to new subscribers. Citycell had initially launched services with analogue AMPS technology; later they have introduced CDMA in 1998. CDMA is a long-term strategic option for Citycell since this support both fixed & mobile technologies from single infrastructure. At first Citycell sold connections under AMPS system for approx. USD$4,000, which was very high and only targeted towards the high end user. As the competition has increased, Citycell has reduced its start-up cost, in 1998 converted from AMPS to CDMA system and has also changed its distribution policy in 2001. Currently through the new distribution strategy (32 Points of sale) it is targeting the other segments other than the affluent segment in the market. Its coverage includes Dhaka and Chittagong and Sylhet. Citycell also has good political connections and has managed to avoid the interconnection problems that other providers have experienced. The company offers incoming PSTN and charges competitive rates. CDMA is a long-term strategic option for PBTL as these technology supports fixed & mobile services from single infrastructure. Being the only operator having nationwide license for fixed wireless services, PBTL diligently addresses the potentials. The operator contracted FUJITSU CORPORATION to roll out synchronous digital hierarchy based microwave link over Dhaka- Chittagong highway. This will help customers to talk while travelling from Dhaka to Chittagong. Although it was the first mobile operator in Bangladesh but it has lost its market share drastically to GP over the last few years. But 2001 was an eventful year for Citycell as it has taken some positive steps which has brought them back into competition again. CDMA is a long-term strategic option for PBTL as these technology supports fixed & mobile services from single infrastructure. Being the only operator having nationwide license for fixed wireless services, PBTL diligently addresses the potentials. They are planning to provide 5,000 fixed connections on the way to Chittagong from Dhaka. They have already established the microwave links from Dhaka to Chittagong & Dhaka to Sylhet. Currently Citycell is selling PSTN, Incoming PSTN & Mobile to Mobile connections. They have slashed down tariff recently by reducing the airtime of M2M (Citycell to Citycell). They have also launched a number of VAS (Sports commentary, Rail timing, and Stock prices). Introduction of mobility in Dhaka-Chittagong highway. – Reduced mobile to mobile outgoing and incoming rate. Introduction of 15-sec pulse rate after 1st minute. Introduction of special service (Sehri and Iftar timing), cricket update. Citycell took an aggressive marketing stance from year 2001. The intensity of their branding and profiling activity has shot up to a large extent. Citycell has advertised their product as a better option than the competitors. They are capitalizing on their airtime tariff, (Tk 2.5 per minute between Citycell to Citycell) which is lower than that of the competitors. Citycell is visible in the fields of sports also. They have sponsored a number of sports activities (Cricket, Golf). Citycell has extended coverage to 11 districts of Bangladesh. The company has a plan to further expanded in another 5 districts in year 2002. Currently they are covering 12% of land area of Bangladesh. Citycell POS stands at 32; which will be 60 at the end of 2002. In 2001 they have sold around 64,000 units. Currently they have a subscriber base of around 105,000. By year 2002 Citycell will cross the 220,000 subscribers mark & by year 2003 they will have around 410,000 subscribers. • Citycell went into contract with Fujitsu of Japan in year 2000. Fujitsu owns 30% share. • Aggressive marketing stance; will increase branding & visibility in 2002. • Plan to launch Prepaid by Q2 2002. • Increase POS to atleast 50. • Coverage expansion in 5 more districts: Bogra, Khulna, Rajshahi, Sunamgonj & Naogaon. Introduction of value added services similar to GrameenPhone and lowering of tariff. By Q2 of 2002 they will introduce Pre-Paid service. Negotiation is going on with an Israeli based company. Citycell has a plan to add around 120K new subscribers in 2002. City cell’s license allows them to offer fixed Radio Network services thereby selling fixed PABX in remote areas. Introduction of new VAS & lowering of the tariff will be emphasized in 2002. Citycell has a plan to introduce 24 hours customer service from June 2002. Citycell has plans to link Khulna this year and eventually to North Bengal by microwave links. They have plans to gradually cover all the districts of Bangladesh in the long term. TM International (Bangladesh) Limited (TMIB), is a joint venture company of Telecom Malaysia Sdn. Bhd., of Malaysia and A. K. Khan & Company Ltd. of Bangladesh. It started its commercial operation in Dhaka, the capital city of Bangladesh as a GSM 900 cellular phone operator on 15th November 1997. Followed to its success in Dhaka, TMIB has started its operation in Chittagong in March 26, 1998. Telecom Malaysia International owns 49% share of the company. Recently Telecom Malaysia’s stake has increased to 80% since local partner AK Khan Telecom is unable to invest further; hence their shares were diluted in TM’s favor. This gradual change in ownership puts Aktel in a stronger position, as TM will have more interest in Aktel’s operation in Bangladesh. TMIB uses the Global System for Mobile (GSM) communications as the digital cellular system which is fully featured with services like Basic Telephony, Data and Value Added Services, (VAS). TMIB has an integrated and fully computerised Customer Care Billing System (CCBS) which supports virtually all subscriber-related functions. The organization is headed by its Chief Executive designated as the Managing Director entrusted with overall responsibilities of business direction of the organization and leading dynamically towards the attainment of its Vision, Mission, Goal. In attaining the above mission, the Managing Director is assisted by four General Managers TMIB has established a strong and formidable sales channels which consists of direct dealers and its own sales force. TMIB is in the Digital Cellular Telephony business. With the technological development in future, TMIB will adopt any cost effective and more efficient technology to provide a state of the art and comprehensive service to its customers. Aktel is selling PSTN, Incoming PSTN & Mobile to Mobile connections. Aktel has launched Pre-Paid service last November. Aktel’s Pre-Paid is not peaking up due to fact that GP’s coverage & image as the market leader is unsurpassed. They have started 30-sec. pulse rate from year 2001. Their Market share stands at 12% as of March 2002. Aktel is not that much visible in terms of branding & profiling; though they have signed contracts with one of the leading ad agency of Bangladesh. They have offered VMS & SMS to its subscribers from November 2001. Aktel has coverage in 8 districts of Bangladesh. The company has plans to further expand in another 4 new districts in year 2002. Currently they are covering 7% of land area of Bangladesh. Aktel POS stands at 65; which will be around 100 at the end of 2002. Their current subscriber base stands at 95,000. Aktel is expected to have 216,000 accumulated subscriber in 2002 and 500,000 by year 2003. Year 2001 was an eventful year for Aktel. It introduced Pre-Paid service in market and have positioned themselves as a competitors for Pre-Paid service. Sheba was awarded a GSM cellular license and launched its services in September 1997. Currently they are operating GSM service in Dhaka only. Sheba Telecom was granted the Rural Telecom License for the period of 25 years starting from June 8, 1994. The license allows Sheba Telecom to provide all kinds of telecommunications service except telegraph and telex. The license covers 195 thanas in the southern part of Bangladesh with about 55 millions population. Based on the experience in the rural telecommunication project, coupled with the expertise of the partners, Sheba Telecom was further entrusted by the Government of Bangladesh to operate nation wide, GSM cellular mobile in November 1996. The license covers a period of 15 years effective from November 11, 1996. Both licenses were awarded through international tender, which has placed Sheba Telecom in a unique position in the telecommunications sector in Bangladesh. But in October 2003 Sheba telecom sell their license to the one of the telecommunication giant of Muslim country, the name is Orascom Telecom. In February 2004 they launch their service and the new name of the company is “Banglalink”. ORASCOM TELECOM is one of the most dynamic telecommunications powerhouses in the world. Orascom is based in Egypt and has operations in 11 countries worldwide. Established in 1998, it is today the largest capitalized company on the Cairo & Alexandria Stock Exchanges with over 11 million subscribers worldwide. It has grown to be one of the largest and most diversified GSM network operator in the Middle East, Africa and Asia. Banglalink aims to understand peoples’ needs best and develop appropriate communication services to improve peoples’ life and make it simple. All our work is aimed towards meeting our vision. All members of the banglalink family are highly passionate individuals, fully committed to achieving the vision that we have set ourselves. Our customers’ needs matter most to us- making their life simple and improving it is all we want. To ensure our vision is achieved, we have set ourselves a few values, we want to be: Straight Forward, Reliable, Innovative, Passionate. All the Banglalink family members have one thing in common- a passion to serve. We want to go that extra mile, so that you can have the best possible service. Investing in the future of Bangladesh. The biggest barrier today for people is the cost of handsets. We will strive to lower the total cost of owning a mobile. We are here to help make a difference in people’s lives by providing affordable and reliable connectivity solutions. We will strive to connect people and link their lives by listening to them and by understanding their needs. We are here to help you speak your language. Teletalk Bangladesh Limited (TBL) is formed as Public limited company under the Companies Act 1994 on 26th December 2004. Therefore it is a Govt. owned company. Honorable President Prof. Dr. Iazuddin Ahmed inaugurated Teletalk Mobile Service on 29th Dec’2004 by talking with Honorable Prime Minister Begum Khaleda Zia. Good relationship with Regularity Authority. Channel Partners are not confident. Lack of support from vendors & financiers. Acquire trained and qualified personnel from other operators. The Telecom sector in Bangladesh is regulated by Telegraph act of 1885 and the wireless act 1993. After independence of Bangladesh in 1971, BTTB was created under Ministry of Posts & Telecommunications with a view to run the telecommunication services on commercial basis. At this moment BTTB is providing basic telecommunication services throughout the country and also providing carriers to communicate with outside world. This is also regularity body of telecom sector. With 550,000 fixed phone lines by the end of 2001, at present BTTB’s penetration rate is 0.42%. 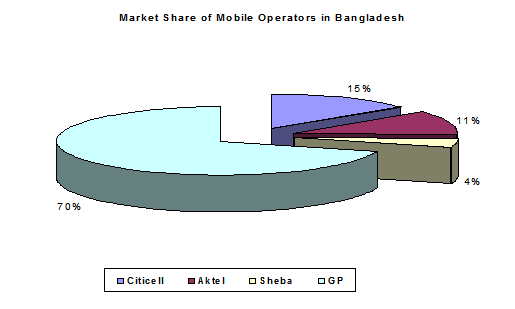 Bangladesh Telephone & Telegraph Board (BTTB) is GP’s (the mobile market leader) largest competitor. Recently BTTB has reduced NWD & ISD charge. At the end of 2001 BTTB had around 644 Telephone exchanges with capacity of 800K units. According to BTTB total number of fixed phone at the end of year 2001 is around 575K units. One thing to be observed is that the Analogue exchanges are being phased out, as some of the exchanges are converted to Digital. Though increase in number of exchanges is a positive sign, yet the increase is far from meeting the growing demand of the market. Considering the population growth trend the demand for telephones are projected to reach 6.5 million by year 2010 as per BTTB. BTTB currently has around 575K subscriber and exchanges in all the District towns. BTTB is planning to provide 300K units fixed phone to capital Dhaka by year 2004. In this regard they have signed a deal with a foreign Company. BTTB has also received permission from MOPT to launch a GSM network. The state owned BTTB plans to introduce mobile phone service at a cheaper rate. BTTB has floated an international tender last year; in this regard for supply, install and commissioning of equipment. It has planned to provide 400,000 connections initially in Dhaka. BTTB has a plan to float another tender before June 2002 as the earlier offer were cancelled since the suppliers do not comply with the terms & conditions. They will use microwave link as transmission and will enjoy speedy and low cost involvement in development of infrastructure due to already built BTTB infrastructure in Bangladesh. Currently Alcatel has agreed to provide the technical support on deferred payment basis. Hopefully by year 2003/ 2004 BTTB will launch a GSM service. Growth of other mobile operators. Advantage of Mobile phones over fixed phones. Inefficiency & incompetence corruption in workforce. Lack of interconnection with Mobile operators. As of year-end 2001, Combined clientele of the country’s private mobile phone companies: Citycell, GrameenPhone, AKTEL and Sheba — have outnumbered the customers of the state-run Bangladesh Telegraph and Telephone Board (BTTB) by 11 per cent. fixed-telephone subscribers. With individual growth rates (GP 146%. Aktel 181%, Citycell 199%, Sheba 42%), the mobile market posted 142 per cent annual growth on average in 2001. This figure corresponds to 82 per cent compound annual growth rate during the last five years competition in the world’s one of the poorest economies. GSM operators are dominating the market with 88 per cent penetration, as CDMA and AMPS share the rest. At present there are 70 ISPs in the country with a subscriber base of 45000. International regulatory problems, less affordability of equipment has restricted its growth. Integration of Internet with mobile devices. New and innovative products and services. Similar to Sheba’s Rural Telecom, Bangladesh Rural Telecom Agency (BRTA) provides local wireless phone service in the north of Bangladesh. BRTA has a poor relationship with BTTB, largely stemming from delinquent accounts for providing PSTN connection. While BTTB had disconnected BRTA for outstanding balances, service has resumed. The company’s network relies on old technology, and serves a small customer base. BRTA perennially suffers from corruption and is not viewed as more than a marginal player in Bangladesh’s telecom industry. Recently, five calling card companies have acquired license in Bangladesh. They will soon start commercial operation. At present they only have the permission to use PSTN i.e the BTTB network, thus they are now trying to get approval to use mobile operators network. expand the number of fixed lines in Bangladesh and provide an alternative to BTTB. Because of this, the company’s presence would benefit cellular providers who share limited access to the existing PSTN network. In the mobile market GP faces competition from Citycell, Aktel and Sheba (Banglalink). The following Figure 23 shows that the percentage of market share of other companies have declined sharply, due to the fact that GP has been holding major market share for the last four years and intends to maintain that in year 2004.
experience a decline in share compared to the previous years, 2000 and 2001. Figure 25 shows the number of subscribers of the four companies at the end of each year for the last three years. It clearly presents GP in the leading position in the market. Closest to us is Aktel, who is almost one-fifth of GP’s Subscriber base. In Figure 26, by end 2001 GP had around 262 Point of sales (sales outlets) which increased from 202 P.O.S from 2000, while the nearest such number among the competitors is 71 of Aktel. All operators increased its P.O.S number significantly from 2000 to 2001. In the year 2002, GP plans to increase the number of its P.O.S to 350, which is shown below in figure 27. Figure 28 shows that GP increased its district coverage from 36 to 40 in 2001. 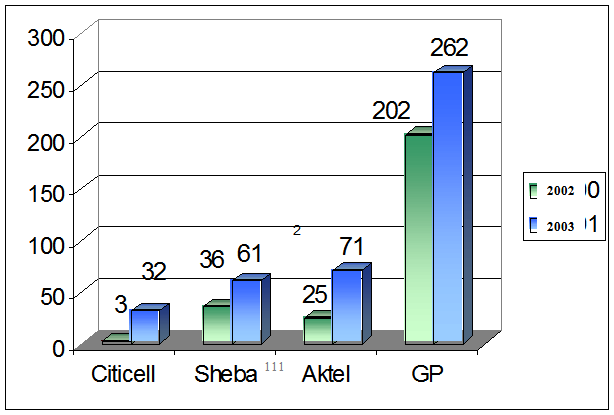 Though Sheba remained the same, Aktel and Citycell were very aggressive in expanding its coverage last year. Citycell expanded to 7 new districts, among them major districts were Sylhet and Cox’s Bazar. Aktel also included 5 new districts including one in Cox’s Bazar. GrameenPhone Plans to expand its coverage to 3 new districts: Chandpur, Netrokona and Chapainababganj. Citycell coverage will be expanded to 5 more districts: Bogra, Khulna, Rajshahi, Sunamgonj and Naogaon. New 4 districts for Aktel in 2002 will be Sylhet, Hobiganj, Maulivibazar and Khulna. Sheba may expand its coverage to North Bengal. The major opportunities of GP’s competitors in the mobile sector would be to capitalize on GP’s expansion and subscriber growth, expand their own coverage to other divisions and en-cash on developed market. By attracting foreign investors they can proceed towards technological advancement and with more financial support the mobile operators can increase their network capacity. By taking new and aggressive marketing strategies, developing competitive & simplified services (with fixed line access) and tariff plans the mobile operators can have potential for growth. They have the opportunity to improve customer service, introduce and implement new distribution concept or can also take over GP’s distribution partners, who have outlets at various corners of the country. The mobile operators have the opportunity to reduce start-up cost and increase point of sales in order to cater to the needs of the different segments of the market. Moreover, capitalizing on GP’s negative image is a major opportunity for the mobile operators. GrameenPhone is a major threat for the other mobile operators as it is the market leader with 69% market share. Uneven playing field due to entry of state owned organization in mobile market is a threat as well as mergers and acquisition of other operators. Political favoritism, innovative application of technology by others, loss of expertise and other telecom operators are also considered as threat for the mobile operators. Introduction of new technologies, better regulatory environment, improved interconnection with other operators, and improved infrastructure are some of the opportunities of the fixed line network. Flexible tariff structure and not applying incoming charges in future could be an opportunity. Increased use of Internet services, setting up of ISDN backbone will enhance their business. Simplifying billing and collection, effective fraud management, continued control on international gateway, countrywide optical fiber for transmission, are some of the opportunities to gain market share. Another opportunity is to en cash on the growth of cellular market. The fixed line operators’ threats mainly include mobile operators and other telecom companies. Since, major revenue of the fixed line operators come from international calls, the introduction of Voice over IP (free or subsidized charge for making international calls through PC), can be a major threat. The slow lengthy investment process, slow technological development, in sufficient interconnections, trade union activities and their influence on management, uncontrollable corruption, non cooperation etc. are some of the major threats. One of the major opportunities for the ISP providers would be to provide access from mobile phone (GP-GP), increased business opportunities because of launching of WAP and providing service at comparatively cheaper rates. Increased regulatory support, low cost of infrastructure and few competition are some of the opportunities of the ISPs. Emergence of the new alternatives in the market, taking advantage of unmet demand for voice telephony (ICC & VOIP) and providing service that complements mobile operators market are also opportunities for the ISPs.. The International regulatory problems, less affordability of equipment, competition from other ISPs, hacking and viruses are some of the threats of the ISPs. The threats of the new alternatives would mainly be the difficulty in educating the market due to lack of awareness of new technologies. Regulatory constraints, lack of confidence in new technologies by our market, constraints on investment are some of the threats for the new alternatives. Capitalize on GP’s negative image regarding congestion in network. Utilize existing infrastructure for GSM service. Despite paying the highest connection fee (Tk.18,400) in South Asia, an applicant waits between five and ten years to hear the first dial tone in the BTTB’s network. This is the best possible performance indicator of state-run telecom monopoly. It has caused Bangladesh struggling with the humiliating lowest telephone per 100 people (below 0.50) in South Asia. The government has failed to achieve its target of one telephone per 100 people by year 2000, as stated in the National Telecom Policy of 1998. Against the backdrop of such a discouraging scenario, the five years old mobile competition modestly delivered what the 50 years old BTTB never succeeded.But inconsistent interconnection regime has been dwarfing the country’s mobile growth. More than 80 per cent of the mobile users are not allowed to access the BTTB’s local, national and international networks. Ministry of Posts and Telecommunications (MOPT), the de facto regulator, never addressed such an operational dilemma. And its too early to comment anything on the performance of the recently formed BTRC. Only GrameenPhone could overcome such regulatory disorder by leasing 1600 km. long optical fibre network from Bangladesh Railway. Ignoring the scarcity of BTTB’s interconnection and defying the standard rules of mobile business, GrameenPhone launched “mobile-to-mobile” service in June 1998. Such customers can only talk to the mobiles but not fixed telephones.Weakness of its “mobile-to-mobile” was transformed into the strength. Covering more than 30 per cent of the 56,000 square miles land mass and 40 per cent of the 130 million population, GrameenPhone broke the BTTB’s long distance monopoly. Its captive customers were liberated by the Bangladesh Railway’s nationwide optical fibre backbone. AKTEL launched “mobile-to-mobile” service in 1998 followed by Sheba in 1999. CityCell also joined the bandwagon in 2000. Customers of these operators enjoy virtual nationwide access by virtue of accessing to Grameen Phone’s network. But the experts have been critical about such “Access divide” being widened by the government. The BTTB is even accused of violating the human rights, as the isolated mobile users cannot call the emergency services like fire, ambulance or police. This was published in the Asia-Pacific Telecom Indicators 2000 of International Telecommunication Union. The industry has, however, been evolving through all the odds. The 61 per cent foreign investors have pumped in excess of US$ 250 million during last four years. GrameenPhone has been leading with investing US$ 130 million as yet. Further spending of US$ 467.25 million by 2003 will make GrameenPhone the single largest investor (US$ 592.25 million) in Bangladesh. Implementation of these forecasts is, however, largely depending on the effectiveness of the country’s first telecom regulator, functional from January 2004. The private mobile phone companies operating in Bangladesh are facing a number of problems, curtailing the rapid expansion of telecommunication facilities. ° The absence of an independent telecom regulatory body (Until recently). ° Lack of adequate interconnection facilities with the fixed line telephones of Bangladesh telegraph and telephone board. A closer look at the mobile industry will reveal that the cash flow generated by it caters a whole load of recipients. The GOB is the key beneficiary. The Government has been directly benefited from the money mobile operators pour into its coffers in return for mobile licenses. Governments also benefit form taxes on earnings of the growing mobile industry as well as from sales tax, VAT on every call that is made. They also benefit indirectly from the boost to economy in terms of out put, technological progress and job creation. Thousands of service provider jobs have been created through out the globe. Equipment manufacturers also benefit. They are zealous in obtaining contracts for building mobile networks. Less than a dozen major companies manufacture the radio transmission equipment and switches to construct mobile cellular networks. Also there are hundreds of small contractors who benefit too. Service provider, viz. PCOs (shops for Phone fax), scratch card distributors, handset vendors, agents, dealers, etc. a whole new industry arising from mobile communications profit form being the intermediary between the network operator and the customer. Other beneficiaries include incumbent network operators (BTTB) who gain from interconnection fees since most mobile phone calls either originate or terminate on fixed line networks. Promote private sector investment, through tax and regulatory policies that encourage innovation and promote long-term investment, as well as wise procurement of services. Ensure that information resources are available to as many citizens as possible at affordable prices. Act as a catalyst to promote technological innovation and new applications. Commit important government research programs and grants to help the private sector develop and demonstrate technologies needed for the national information infrastructure. Provide access to government information and improve government procurement. The Government of Bangladesh should emphasize improvement of telecommunications system in the private sector and creation of a competitive environment for expansion and improvement of the services. Foreign investments in the sector have to be encouraged. Government will have to provide all necessary cooperation so that the private sector operators can play a strong role in the sector in future. Replacement of the analog system with digital system needs to be made within a few years to improve the service quality and put people out of the misery of using outdated technology. To promote competition and investment by private firms. To ensure access to advanced services in rural and high-cost areas. To ensure access to advanced services for schools and libraries. For attaining sustained growth in the socio-economic infrastructure of a nation, a well-balanced and widely developed telecommunication system is one of the major pre-requisites. It is not only the necessity of the urban and affluent group of the society but also of the rural community. At the end of the 20th century, the world is witnessing an explosion in the telecommunication and information society, especially the rapid growth of the Internet and mobile communications, the agreement of the world Trade Organization (WTO) on basic telecommunications, the worldwide trend of liberalization, competition, globalization and the convergence of technology and services. The Bangladesh market for telecommunications is severely underdeveloped and is now poised for exponential growth. The demand for telecommunications is severely unmet and the mobile phone operators can capitalize on this opportunity. Compared to the growth pattern and future plans (current and within the next few years), Mobile operators growth pattern shows an increasing trend. Bangladesh’s poor fixed line infrastructure offers large opportunities to mobile operators. The state-run company plans to increase the number of lines to approximately 800,000 over the next three years, but this is widely regarded as an ambitious undertaking. In contrast, GP along with other mobile operators will achieve nation­wide coverage (95%) by 2005, which would remove the infrastructure barrier to telecommunications penetration. The year 2002 was the time for GP to optimize and maximize its resources in order to secure a stronger position in the market. Grameen Phone had the opportunity to grasp the market as other operators have been very sluggish over the last three years, but this may not be the case in 2004 and in coming years. New competitors are likely to emerge within the next two years, which will increase competition and possible churn, thus building a strong foundation now would be beneficial in the long run. On the cost side, competition between four mobile operators and market growth has driven down the start-up cost and usage costs for subscribers. The prices of handsets have also reduced globally, which gives mobile operators the opportunity to acquire subscriber with less acquisition cost, at the same time providing low start-up cost. With the help of pre-paid service, which helps to give communications access to those with irregular income & bad credit; the village phone program, which allows for communal use of mobile services, GP in particular, can provide modern communication technology to a broad spectrum of the Bangladeshi population. Source; Bangladesh Telecommunication Regulatory Commission. Source: Banglasesh Bank for Bangladesh and Economist Intelligence Unit for other. (in millions) as of mid-year 2007. Bangladesh 2007 figure is preliminary. Source: Bangladesh penetration based on BRTC reported subscribers as of September 30, 2008 and population from Bangladesh Bank. For all other countries, penetration based on subscribers as reported by Informa Telecoms & Media as of September 30, 2008 and population from Economist Iontelligence Unit. Sources: GP audited reports and press releases; Telenor segment reporting. Source: Company for GP, Informa Telecom & Media for other. Source: BTRC, as of September 30, 2008. Helal Uddin Ahmed Ruhel (DM), Monika Ahsan, Ashraful Amin, Call management center, Grameenphone. Personal Interview. Grameen Phone Annual reports 2006/2007. Malhotra, k. Naresh 2006, Marketing Research, 4th edition, Pearson Education, Inc., India. Charles W.L.Hill and Gareth R.Jones, Strategic Management. Newsletter of Grameen Pnone Limited.